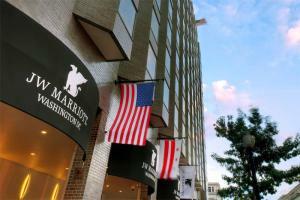 This upscale hotel is conveniently located in the heart of the city, just moments from the National Mall, historic monuments and a museums. Spacious and well-appointed guest rooms feature plush bedding and thoughtful amenities for your comfort. Many rooms offer splendid city views. The hotel offers three restaurants and a 24-hour fitness center. Located on Pennsylvania Avenue. approximately 4.5 miles from Ronal Reagan Washington National Airport (DCA) and 26.5 miles from Washington Dulles International Airport (IAD).